I’ve yet to find anywhere in the world that gives me the same sense of peace as Sitka does. Just pulling into the harbor and stepping onto the dock, my body relaxes bone-marrow deep. And if I had to pick a single place where that slow down, breathe deep, let go effect is strongest, it would be Totem Park. Strange to find peace on soil so scarred by grief. This dense Tongass rainforest spooning the sea is the site of the Tlingit/Russian 1804 Battle of Sitka. Formally known as Sitka National Historical Park, these 113-acres gained national monument status in 1910, in commemoration of that combat. 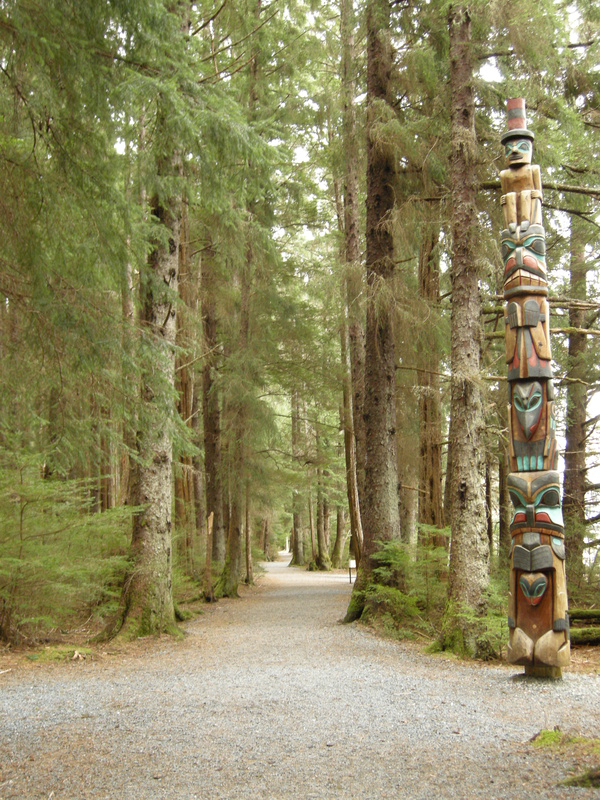 2010 marked Totem Park’s Centennial. A year’s worth of ceremonies are concluding with the raising of a new totem. 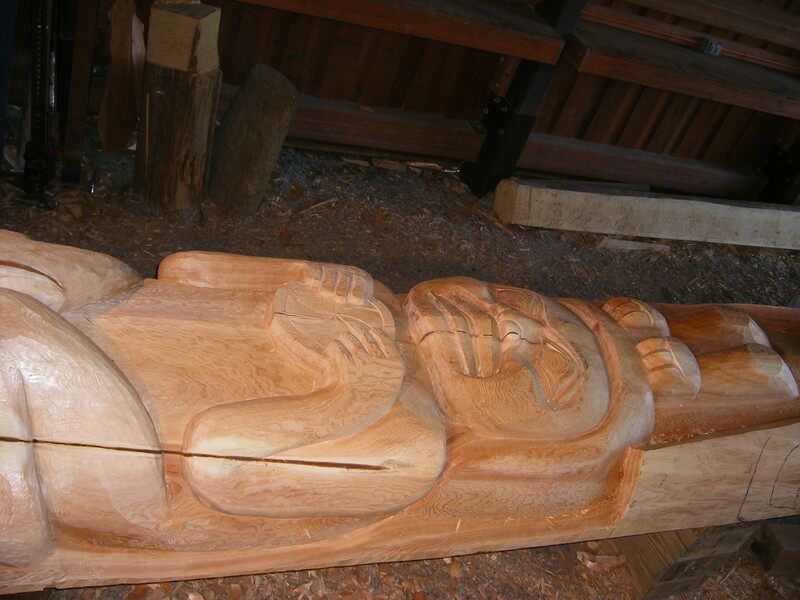 Tommy Joseph, world-renowned carver and Southeast Alaska Indian Cultural Center Artist-in-Residence, was commissioned to do this project. A project he would typically give 5-6 months, completed in just over one. I considered that. Imagined the honor and responsibility of such a task. And I marveled at Tommy’s casually inclusive attitude, wondering: Would it truly be “okay” for a white person – like me – to participate in such sacred creation? I tried to imagine what it would be like to shave away bits of cedar, to witness the story within that particular log revealing itself, a friend who exposes more of their true self as time and trust build. And I wondered, how would Tlingit carvers feel, working alongside hands that wore the same skin as those who chopped down totems, stole homeland and history, stole the very words from their ancestors’ mouths? These are valid questions. But perhaps they’re more reflective of my own personal process. Sitkans are about getting the work done, and bringing a totem to life requires many workers. Because – as Sitkans have taught me – if it takes a village to raise a child, it takes a town to raise a totem. I still remember the new understanding born in my brain that day. Politicians could represent their communities, take action for what they believed in, while simultaneously existing as “real” people. They could even be someone I might pass on the dock – a salmon-scented, broken-bodied, diesel-fingered fisherman devoted to the same livelihood as my family. And devoted he was. Senator Eliason passed away on April 3, 2011, after a lifetime of political service that demonstrated his unwavering commitment to Alaska’s wild salmon stocks. He modeled a long-sighted vision of resource utilization and conservation, a balance of harvester and protector that we’d do well to study. 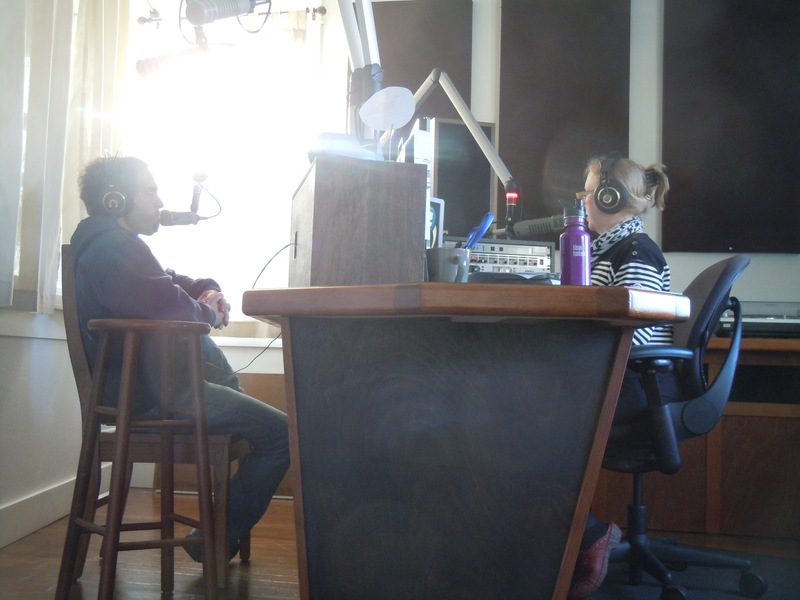 You can read/hear an eloquent remembrance of his life here, thanks to Raven Radio’s reporting. My heart goes out to his family and friends. Safe seas and good fishin’ to you, Sir.